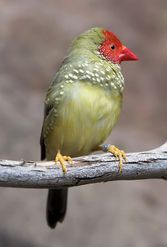 We offer a wide selection of aviary bred birds including a variety of Finches, Canaries, Budgies, Parrots, Lorikeets, Cockatiels, Cockatoos, Lovebirds, Mandarin Ducks, Doves and Plovers. We prefer to buy locally bred stock from aviculturists known to us to ensure quality. 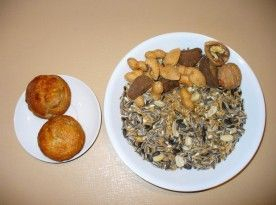 As demand for these birds are high, you are advised to place orders for these well in advance to secure your bird when available. 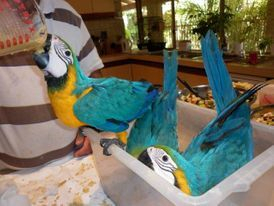 All hand reared birds are spoon fed, consequently are tame on acquisition. Birds have been kept as pets for time immemorial. Their magnificent plumage and for the most part a good ability to mimic sounds have made them increasingly popular as pets. It doesn't make a great deal of difference whether they be large or small, native or exotic or whether they are seed eaters or nectar consumers, all are individuals and need to be accepted as such. 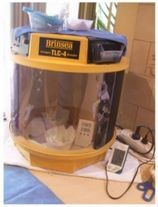 We a Birds 'n' All pride ourselves in either breeding and hand rearing birds ourselves or acquiring birds from breeders who are endorsed by us. 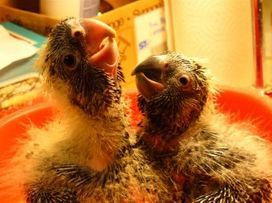 We would also be the first to agree that there can be a distinct difference between a 'hand tame' and 'hand reared' bird. The former is a reflection of the time and effort spent with a young bird whilst it is being hand reared whereas the latter doesn't necessarily mean the bird welcomes human interaction. 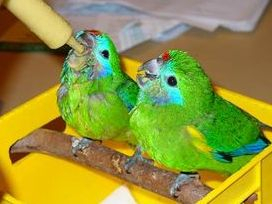 Whilst we fully agree that a young bird which is spoon fed, or syringe fed will generally respond to a human companion, a crop fed bird can also do so if the owner/hand rearer spends sufficient time interacting with the young bird after feeding it and certainly has a high potential to becoming a good pet or companion bird when weaned. 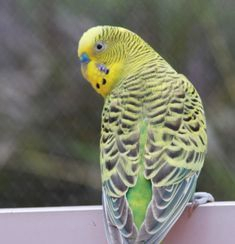 It is critically important to consider before purchasing a bird; your own time commitment, the environment your pet bird will be placed in, your neighbour's attitude to a possible noise issue, size of bird and level of care, potential allergic reactions to other members of the household and remember some species can live up to 100 years. Your new acquisition will regard you as its life partner and establish a stronger bond with you than any human could! 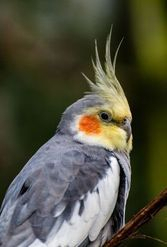 These birds will love you unconditionally and completely rely on you to care for and provide the best for their physical and emotional wellbeing. 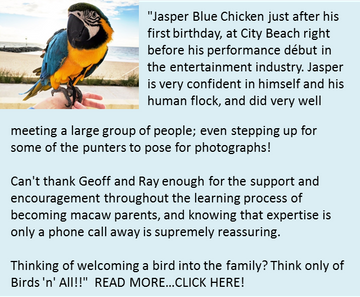 We also highly recommend that a bird is well socialised from an early age as should you be absent for a period of time the bird does not suffer what is regarded as 'separation anxiety' which can lead to psychological problems. 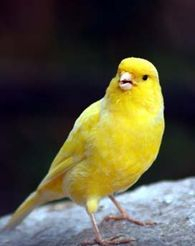 When a hand reared tame bird is sold by us we ensure the new owner is provided with all the relevant details in regard to dietary requirements, general care and management, books to assist in caring for your new pet and details of who we consider as preferred avian vets. 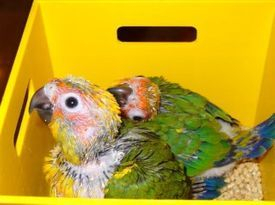 In short, when thinking of purchasing a pet or companion bird please do consider the needs of the bird above your own and be prepared to make a long term commitment rather than act on a whim. REMEMBER your new pet will rely on you to care for it in the best possible way and it will return your love tenfold! We hand raise many varieties of birds...Parrots, Cockatoos, Lorikeets, Cockatiels & many more. We have great pleasure in announcing that Dr Toni Cockburn, a good friend and respected vet with Avian qualifications has recently commenced a mobile service and we have complete confidence in her ability, knowledge and commitment to all who have loved pets. 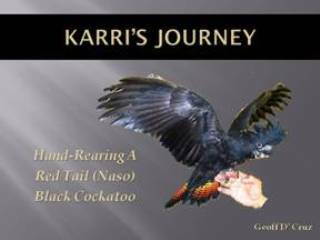 To view a PowerPoint Show on "Hand Rearing Red Tail Black Cockatoos"
13 Hulme Crt, Myaree, WA.